Lots of new features were delivered this year! In case you missed anything, we invite you to explore this 2015 Year in Review. 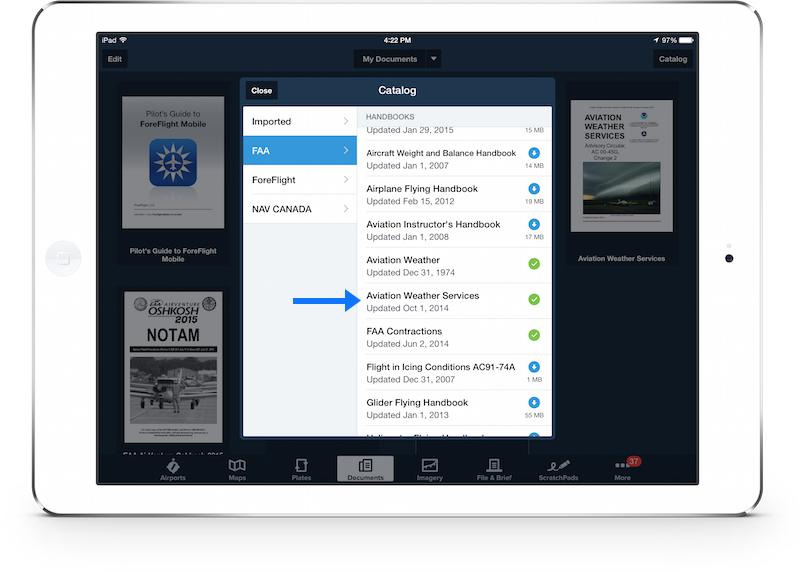 We are thrilled to deliver ForeFlight Logbook in our final release of the year. In addition, insightful Area Forecast Discussions are now built-in to airport weather views. 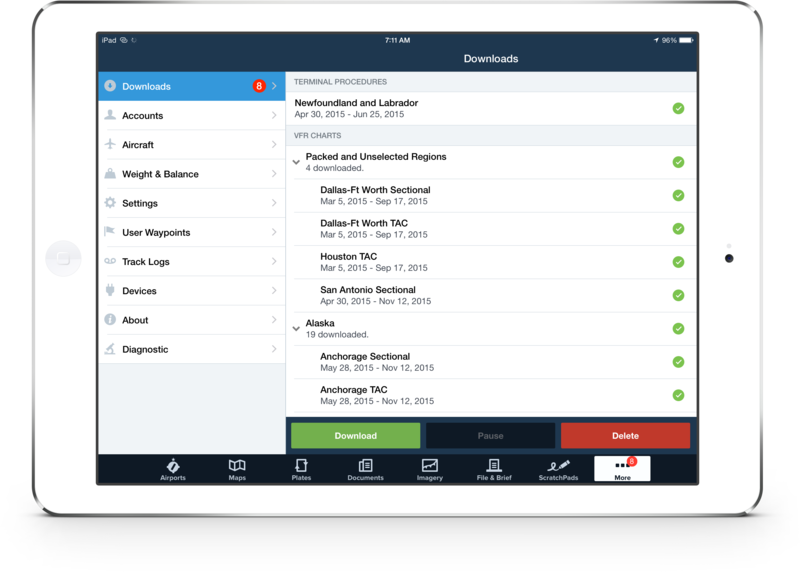 Logbook is seamlessly integrated into the ForeFlight app, making it easy for pilots to manually and automatically log flights, track hours, review currency, record certificates and ratings, receive electronic instructor endorsements, and generate experience reports. In addition, your Logbook data is automatically and securely stored in the ForeFlight Cloud. ForeFlight’s servers regularly backup the logbook when changes or additions are made, delivering a new level of security and assurance for digital pilot logbook data. ForeFlight’s Sync platform seamlessly synchronizes your logbook information across all of the devices on your account. Logbook is available as part of our new Basic Plus and Pro Plus plans or as an add-on to your existing plan, as well as an optional add-on to Business Pro multi-pilot plans. 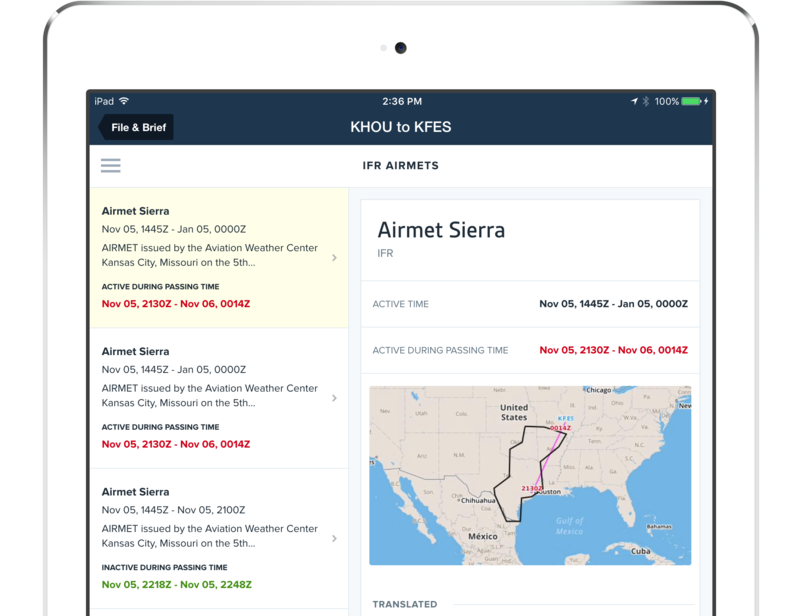 Learn more about Logbook at foreflight.com/logbook. As Scott Dennstaedt says in his blog article on the topic, with ForeFlight 7.5 “you’ll have the ability to peer into the minds of forecasters.” Well, close. You can now access Area Forecast Discussions (AFDs) in ForeFlight. Area Forecast Discussions are now provided for all US airports with their associated TAFs. These are issued by forecasters at the National Weather Service and provide important insights into forecast conditions, acting as a complement and explanation for recently issued TAFs. 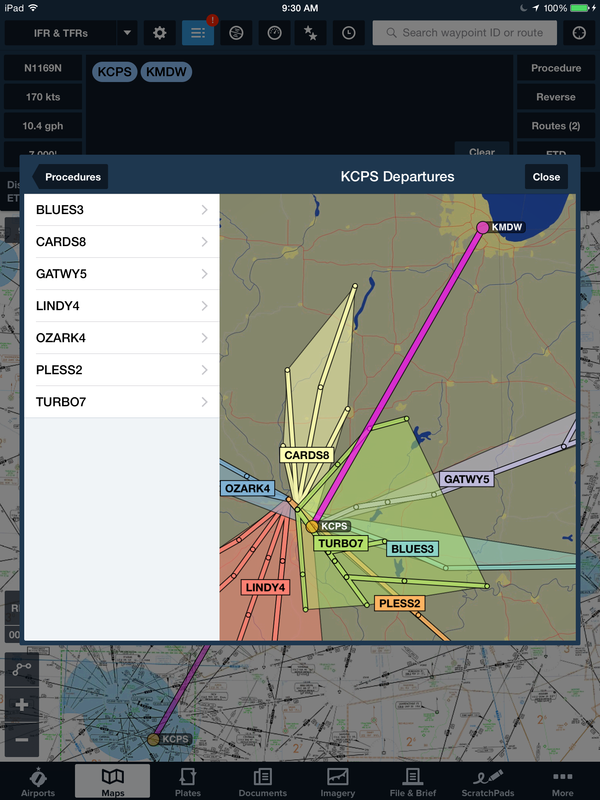 The AFDs can be found in ForeFlight by tapping on a station in the Maps view, then tap Forecast in the pop-over. Also in the Airport view, tap the Weather tab then Forecast Discussion. Check out Scott’s article where he walks through how AFDs can be routinely used in your flight planning. 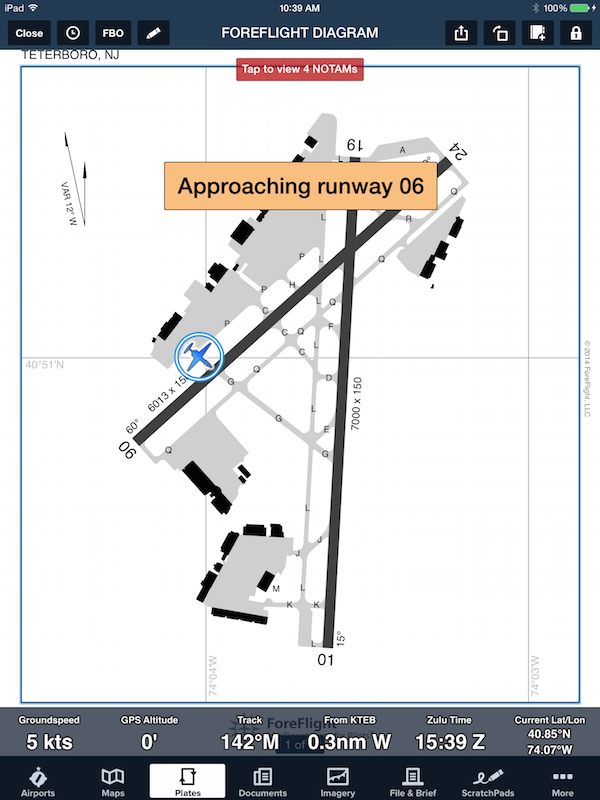 Do you know the size of the terminal area that is considered when a forecaster issues a TAF? Read Getting Into The Forecaster’s Head to find out. Coupled with the introduction of Logbook, we are also announcing new subscription plans for individual pilots that are designed to give you even more value from your ForeFlight experience. Logbook is an essential part of your flight bag and so we made it a standard feature in both of the new plans. The new Basic Plus plan includes everything in the current Basic plan plus Logbook and Weight & Balance for $99.99/year. The new Pro Plus plan includes everything in the current Pro plan plus Logbook and Synthetic Vision for $199.99/year. If you are pleased with the plan you have now, you can still purchase or renew the existing Basic and Pro plans. You can manage this by logging in to foreflight.com/manage with your ForeFlight app credentials or by using our build your own plan link on foreflight.com/pricing. 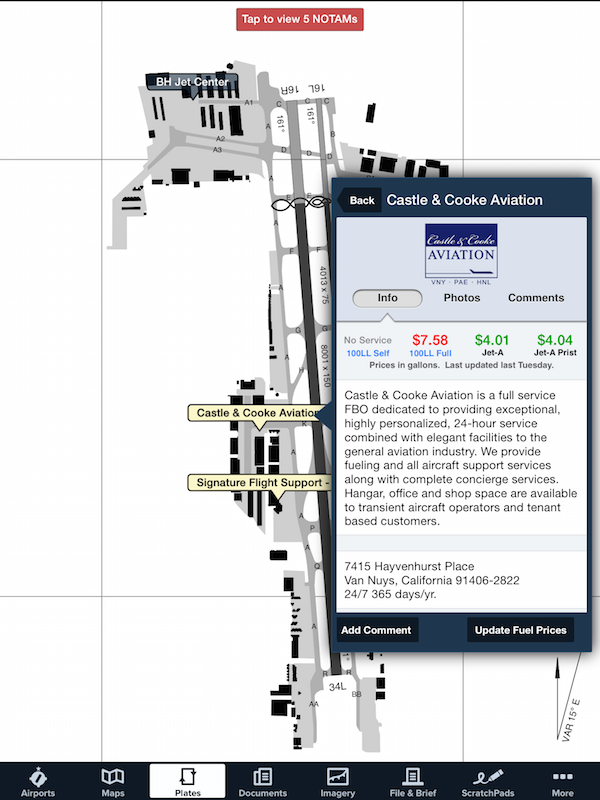 For more details about the new plans, visit foreflight.com/pricing. For Business customers with multi-pilot accounts, the Business Pro plan details can be viewed here. The second phase of our ForeFlight Connect integration with Garmin avionics is complete and you can now seamlessly transfer your flight plan between ForeFlight Mobile and Garmin GTN and GNS navigators when connected via the Garmin Flight Stream 210, Garmin’s Bluetooth wireless gateway, making everything from pre-flight planning to inflight re-routing easier and faster. ForeFlight pilots can load a simple route, as well as approaches, SIDs, STARs, routes with airways, and search and rescue patterns. ForeFlight Mobile also receives route changes you make on the Garmin navigator, keeping your panel and iOS device in sync. 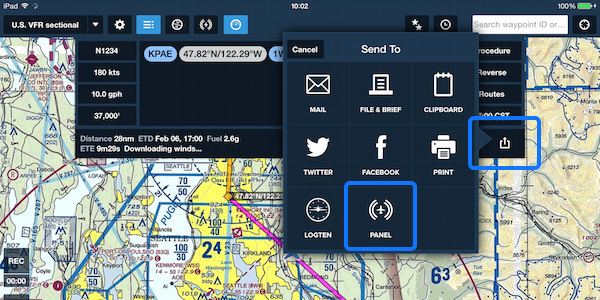 Coupled with ForeFlight Web, connectivity with your Garmin panel creates a true web-to-panel flight planning experience. Plan your day’s flight from the comfort of your desktop web browser and then ForeFlight’s secure, cloud-based Sync system sends your web planning activity to your iPad. The seamless handoff allows you to pick up and finish your plan on the iPad and send it to your panel. 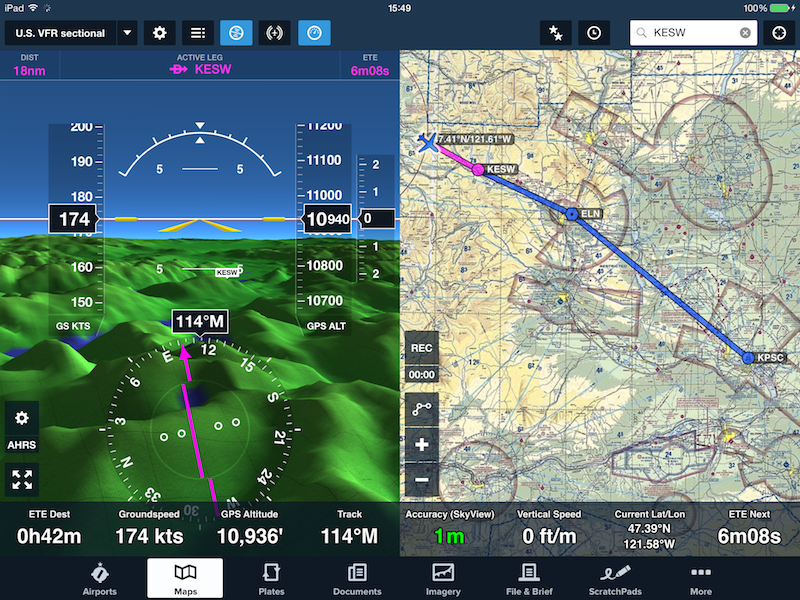 In the air, the combination of ForeFlight and Flight Stream enables you—or your co-pilot—to quickly set up and program a new route if you need to divert. 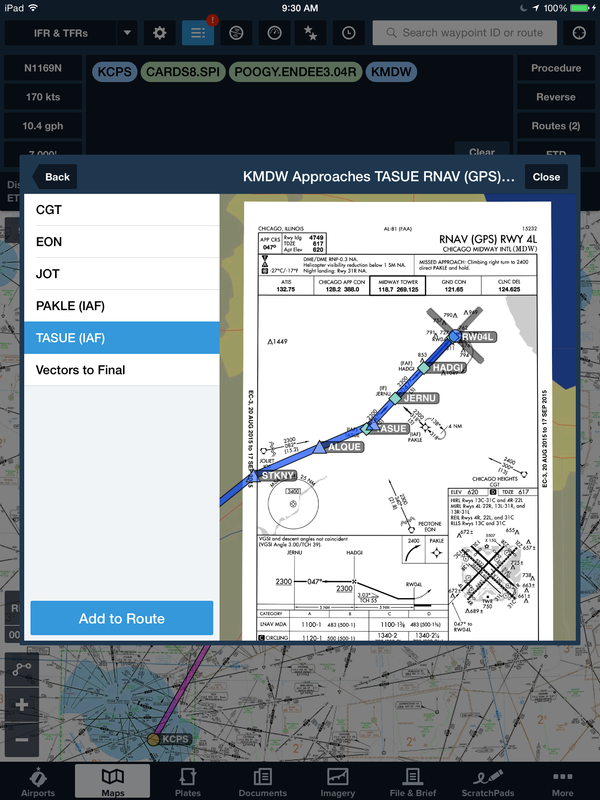 ForeFlight Mobile has coded procedures, so creating complex routes with SID, STAR, and approach waypoints is easy and intuitive using Procedure Preview. The flight plan transfer capability with Garmin means that you don’t have to waste time rebuilding that route in the navigator—sitting in the airplane, on the ground, engine running. 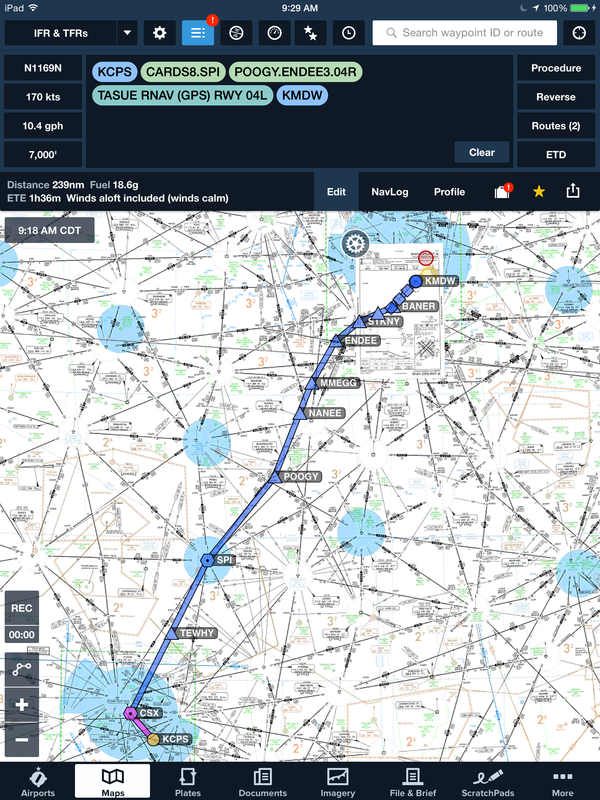 Another example of how ForeFlight Mobile and Garmin flight plan transfer combine to make pilot life easier is to file your flight plan from the app. If you are a ForeFlight Mobile Pro customer, we push expected route notifications to your device. With a tap, load expected route changes into your Navlog, re-file the amendment from ForeFlight Mobile, and then at the airplane send your expected route to your panel before taking off. Getting in the air faster is also mission critical to search and rescue operations. 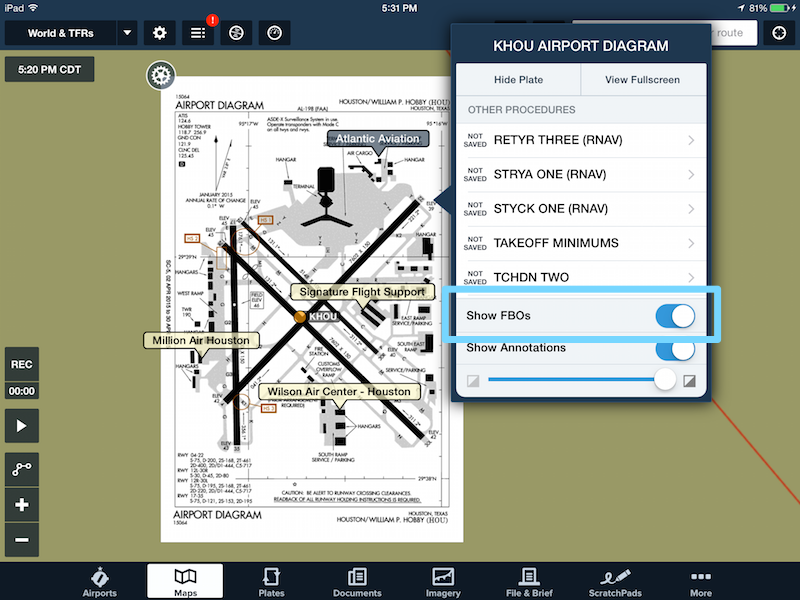 ForeFlight Mobile’s Procedure Preview is a time-saving tool for building search and rescue patterns. Use ForeFlight’s wireless sharing capability or email to share and brief the plan with other members of the search team and then quickly transfer the route plan, with the SAR pattern, into your Garmin navigator. The Flight Stream 210’s built-in AHRS also provides pitch and bank information for ForeFlight’s Synthetic Vision and backup attitude displays, and a connected GDL 84/88 rounds out the experience by delivering ADS-B traffic and weather information to your iPad display. Tap the ‘Panel’ button at the top of the Maps view and then tap ‘Send to Panel’. This sends the route currently displayed in the Navlog to your Garmin navigator. ForeFlight Mobile version 7.2 supports the next generation of portable Stratus ADS-B receivers, expands our Sync system to include Weight & Balance profiles, increases the temporal resolution of the global winds and temperatures aloft for more accurate flight plan calculations, and improves the delivery of critical flight alerts with Graphical Flight Notifications. ForeFlight Mobile version 7.2 is currently available for download on the App Store. ForeFlight Mobile 7.2 supports the next generation of Stratus portable ADS-B receivers, which were announced last week. Our close development partnership with Appareo and Sporty’s means that Stratus is built from the ground up to work with ForeFlight Mobile and simply works the right way. Pilots using Stratus and ForeFlight experience seamless one-button-push and wire-free operation, easy over-the-air firmware updates, and the flexibility to view and manage Stratus settings right from the app. The best part is, even if you haven’t equipped for the 2020 mandate yet, Stratus allows you to take advantage of ADS-B weather and traffic information for better inflight situational awareness and decision-making. This blog article and the video from Sporty’s both detail all the features in the new receivers. For fleet operators, Stratus is an excellent addition to your electronic flight bag program. Stratus is a wireless, portable PED so no modification to the airframe is required. For more information contact sales@foreflight.com. We are thrilled to announce connectivity between ForeFlight Mobile and Garmin avionics. When connected to Garmin Flight Stream, you can now wirelessly receive ADS-B weather and traffic, precise GPS position data, and dynamic pitch and bank information on your iPad or iPhone. Our blog post here details this exciting integration. Flight Notifications shown in list view with new graphical thumbnails. Tap to expand the image. We previously introduced Flight Notifications, a feature that monitors your filed flight plan and synthesizes flight condition alerts from ForeFlight systems and from others, including Lockheed Martin’s Adverse Conditions Alerting Service (ACAS). When a significant change in route or weather conditions is detected within two hours of your scheduled departure we send you a notification containing a summary and detailed description of the condition. We now include a helpful graphic along with the flight critical information making it easier to analyze the alert and to stay better informed before every flight. Thumbnail graphics are shown next to each alert in the Flight Notification window; tap on an alert to view a larger version of the image. Flight Notifications include updates to: TFRs, airport/runway closed/unsafe NOTAMs, urgent PIREPs, SIGMETs, Convective SIGMETs, AIRMETs, Center Weather Advisories (CWAs), and Severe Weather Watches/Warnings that affect your filed route. Flight Notifications are tied to ForeFlight’s Sync system, meaning the notifications are delivered to all of the devices on your account. To activate Flight Notifications, Sync must be ON. On the iPad, navigate to More > Settings, then scroll all the way down to Synchronize User Data. Before filing the plan, scroll to the bottom of the flight plan form on the File & Brief page and move the Flight Notifications switch to ON. Once you file a flight plan, ForeFlight will notify you of any new conditions via a red badge (showing the number of notifications) on the File & Brief tab. Flight Notifications require an active Internet connection and are a ForeFlight Mobile Pro feature. We continue to advance our ForeFlight cloud system, Sync, with the addition of Weight & Balance profiles. Your aircraft load data now synchronizes between all your devices so you don’t have to enter the same information on multiple devices; add or edit a profile on one device and those changes are automatically applied to all devices on your account. This is especially helpful if you fly multiple aircraft and maintain several weight and balance profiles. Sync protected data also makes it easier to set up a new device if you are replacing an old one. Weight & Balance is a Pro feature, however Sync is available to all customers and, in addition to Weight & Balance profiles, includes: recent and favorite routes, airports, and weather imagery, user waypoints, scratch pads, flight notifications, filed flight plans, and aircraft profiles. Sync can be turned on by enabling Synchronize User Data, located in More > Settings, near the bottom of the page. ForeFlight Mobile 7.2 also introduces an increase to the resolution of the global winds and temperatures aloft. Flight planning calculations are now even more accurate with a forecast time step of three hours instead of the previous six hours. This blog article from Scott Dennstaedt discusses the enhancements to the global Winds Aloft layer. The Apple Watch is an exciting and evolving platform, and we will continue to develop ForeFlight for Apple Watch to expand the app in helpful ways. In 7.2, we introduce some refinements to the Airports page, allowing weather data from up to 30 airports to be viewed under three selectable tabs: Nearby, Recents, and Favorites. ForeFlight Mobile version 7.1 equips you with more weather briefing and analysis tools in the Imagery view to make better go/no-go decisions, delivers subscription-free weather and ADS-B traffic via FreeFlight Systems’ certified RANGR-series ADS-B products, and gives you more options to manage chart downloads. We are a company of pilots and so we understand that weather is a top priority when it comes to flight planning and decision-making. 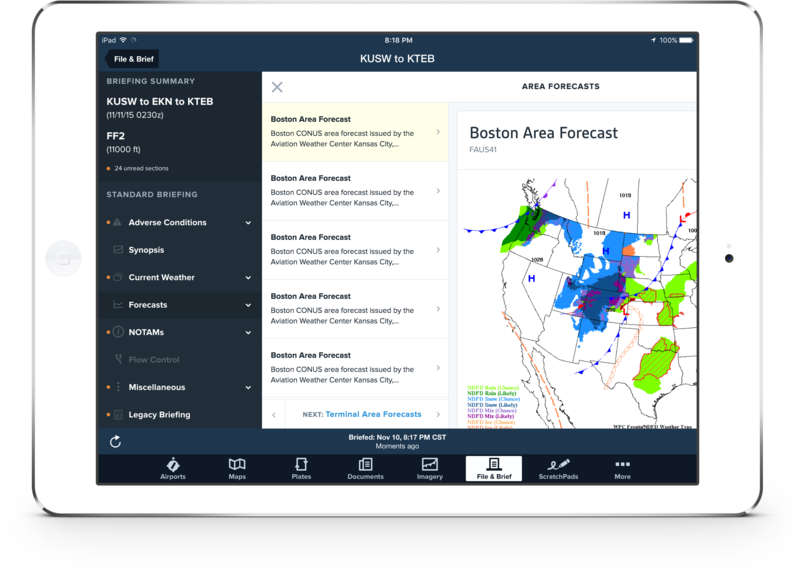 Having our own in-house Weather Scientist (Scott Dennstaedt) allows us to focus on advancing the capabilities of the preflight weather briefing tools within the ForeFlight platform. Scott and the development team have been busy thoughtfully organizing ForeFlight Mobile’s Imagery and nearly doubled the number of collections in the library. Eight new weather image sets are available and include forecasts for ceiling and visibility, convection, and precipitation. Additionally, products like icing, turbulence, and AIRMETs are enhanced with greater resolution of altitude and/or time. This article from Scott provides an introduction to the new weather imagery collections. Over the next few weeks we will provide more guidance and insight on how to effectively use these weather products in your day-to-day preflight planning regiment. So stay tuned to Twitter, Facebook, your email inbox, or right here on the ForeFlight blog for more details. The Pilot’s Guide to ForeFlight Mobile is also a great resource to learn more about the new weather imagery collections. We have also added a Recents button to Imagery view on the iPad version of the app. Now you can view and swipe through all of your favorites and recents on your iPad or iPhone. For those of you that move between devices while planning, these settings sync so that you can easily pick up on your iPad where you leave off on your iPhone (or vice versa). The new forecast weather products are available to all subscribers. Refresh your weather symbology knowledge with the Aviation Weather Advisory Circular in ForeFlight Documents. Test drive the new NDFD Progs. The Prognostic Charts that pilots have known and used for years are undergoing a facelift this Fall. As part of the Imagery enhancements, we are including these new charts giving you a chance to become familiar with them before they are officially released by the National Weather Service. Read this article from Scott where he walks through the new features of this helpful weather prediction chart. Our ForeFlight Connect program now includes FreeFlight Systems’ RANGR-series of certified ADS-B products. 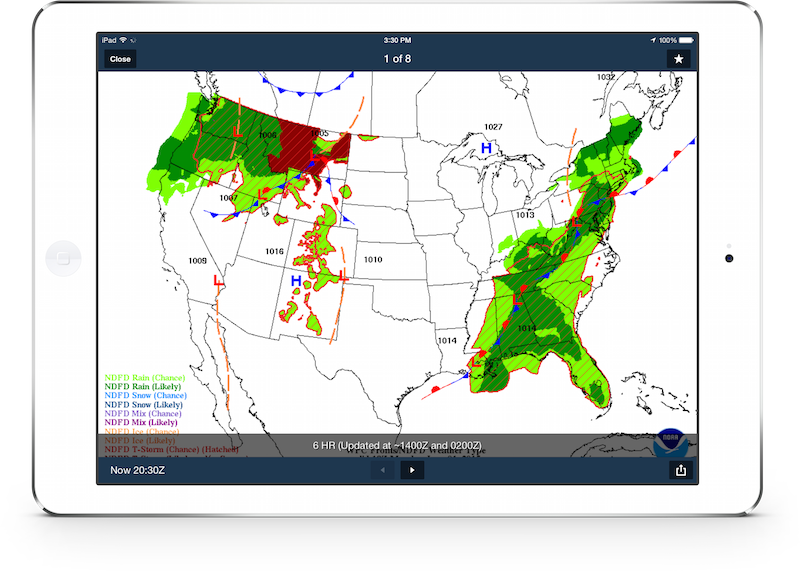 The FreeFlight Wi-Fi connectivity solution enables you to affordably equip your aircraft well in advance of the FAA’s 2020 mandate and immediately realize the benefits of inflight subscription-free FIS-B weather and TIS-B traffic on your iPad or iPhone. The RANGR GPS receiver also provides position source and data for the ForeFlight Mobile moving map view and instrument panel. ForeFlight Mobile is compatible with any certified FreeFlight Systems product that has the capability to receive data. This includes the FDL-978-RX, FDL-978-XVR, and FDL-978-XVR systems. We have received lots of positive feedback on Delta Downloads and the 70%-plus increase in download speed that the system delivers. With 7.1, Delta Downloads is activated on all customer accounts. In addition, the Delta Downloads infrastructure enables some helpful changes to the way US VFR charts and IFR Enroute charts can be managed in the Downloads view. IFR High and Low Enroutes and US VFR charts are grouped by State or Province. We have made it easier to manage these charts both as individual downloads or grouped by State or Province. Tap the rotating caret to reveal individual charts in a State or Province group. New section header showing Packed data. A new heading—“Packed and Unselected Regions”—contains charts you have Packed, as well as those you regions you may have de-selected. The re-organization makes it easier to see charts you may want to delete or unpack. As noted in a previous blog post and via a customer notice email, iOS 8.3 introduced an incompatibility with previous generation GPS accessories like the DUAL XGPS 150 and some Bad Elf devices. The issue was escalated to Apple by ForeFlight and Bad Elf and, based on PIREPs we have received, is expected to be resolved in the forthcoming iOS 8.4 update. This issue has frustrated many pilots who own Wi-Fi only iPads or GPS accessories, and we are glad relief is on the way. ForeFlight Mobile version 7.0.1 is now available for download on the App Store. This release improves performance for the new Procedure Preview feature, the Procedure Advisor tool, and the ForeFlight for Apple Watch app. In addition, this release opens up Dynon SkyView connectivity to both Basic and Pro subscribers. With ForeFlight Mobile 6.7 we are excited to announce wireless connectivity between ForeFlight Mobile and the Dynon Avionics SkyView system. The integration with Dynon expands our ForeFlight Connect capability ‒ a set of features that allows ForeFlight Mobile to connect to portable and installed avionics to enable capabilities like flight plan transfer, ADS-B weather (currently Stratus only), and more. We also re-invented the ScratchPad view to provide much more capability. Use the helpful new templates feature for quickly jotting down clearances and PIREPs, save and share multiple ScratchPads, and swipe between ScratchPads with a simple gesture. ScratchPads are integrated into the ForeFlight Sync system so all your notes are automatically backed up across your iPads. In the Maps view we added a global graphical Winds Aloft layer that shows wind barbs on the map for altitudes from 3,000′ to 54,000′. The new altitude slider lets you easily see how the winds change across the world and across the flight levels. ForeFlight Mobile version 6.7 is now available on the App Store. We are delighted to work with Dynon Avionics to bring Wi-Fi connectivity between your iPad and iPhone and the SkyView glass panel system. 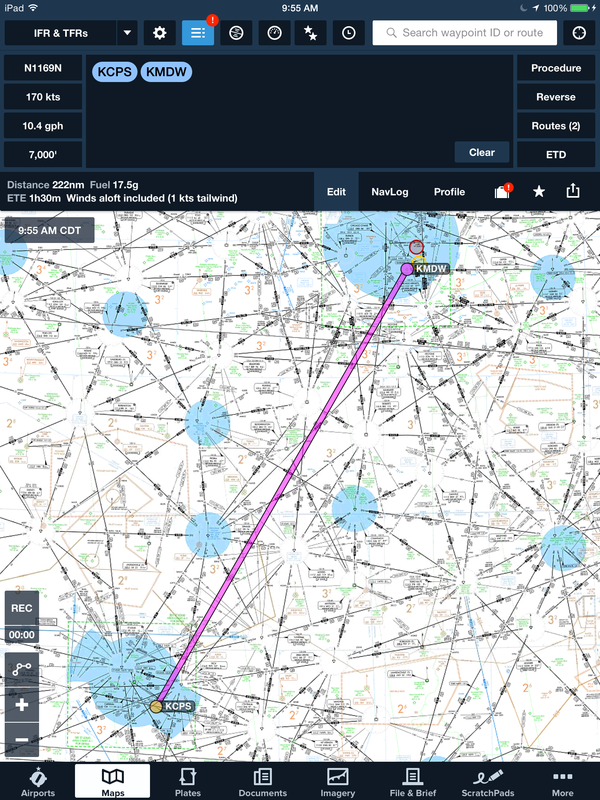 ForeFlight Mobile can send and receive flight plan routes on the ground and in the air and can receive SkyView WAAS GPS and AHRS data to feed Synthetic Vision and the moving map display. In the Route Editor on the Maps view, use the Send To button to transfer route plan changes from ForeFlight to SkyView. To pull flight plan changes from SkyView into ForeFlight tap the Connect icon in the top menu bar. In addition to transferring flight plan route changes, ForeFlight Mobile receives SkyView’s built-in WAAS GPS to drive aircraft position on the Maps or Plates view. This is a great GPS solution if you have a Wi-Fi only iPad, or if you just want the reassurance of an additional GPS source. ForeFlight Mobile also uses the SkyView AHRS to display pitch and roll information on the Attitude Indicator and Synthetic Vision views. ForeFlight Mobile receives the SkyView GPS and AHRS data to feed the moving map and Synthetic Vision views. 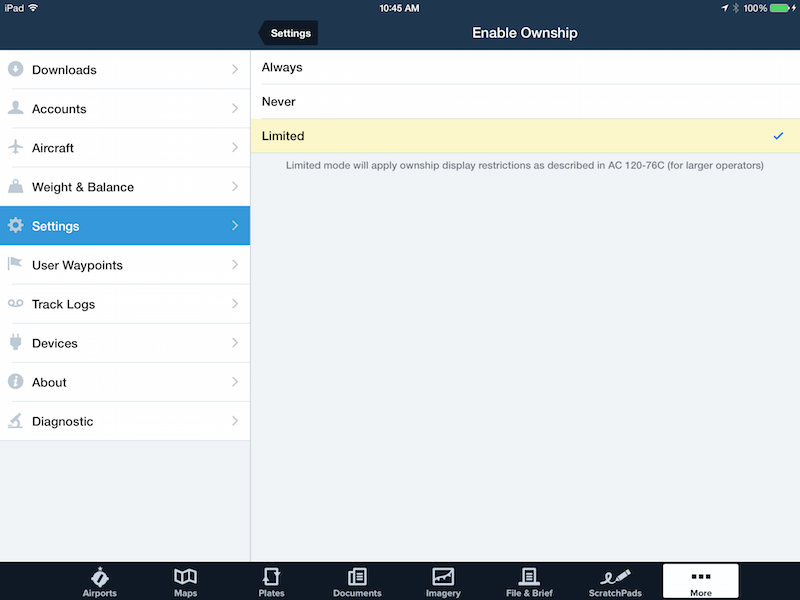 The wireless connectivity feature between ForeFlight and Dynon SkyView requires a ForeFlight Mobile subscription (Basic or Pro) and a Wi-Fi Adapter for each SkyView screen. Read this blog post for more details on how to set up and use the wireless connection between ForeFlight Mobile and Dynon SkyView. Also check out our ForeFlight Connect page to learn more about our growing wireless connectivity capabilities. The ScratchPads feature was re-written for v6.7. Now you can choose from six different templates, including a PIREP template to help you transmit the perfect PIREP with confidence. 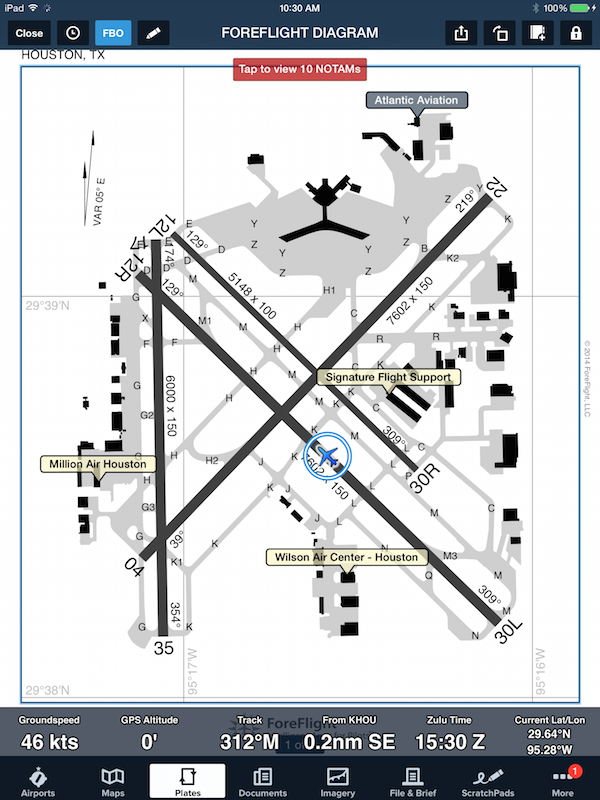 The CRAFT layout makes it easy to use the well-known aviation mnemonic for copying down departure clearances from ATC. The ATIS ScratchPad keeps terminal weather and conditions information organized. Freestyle notes or a drawing on the Grid view. Quickly and easily submit PIREPs by scripting them on the PIREP template first. Add, edit, rename, and delete multiple ScratchPads. If you prefer to write with a stylus versus your finger, check out this popular one from Sporty’s. 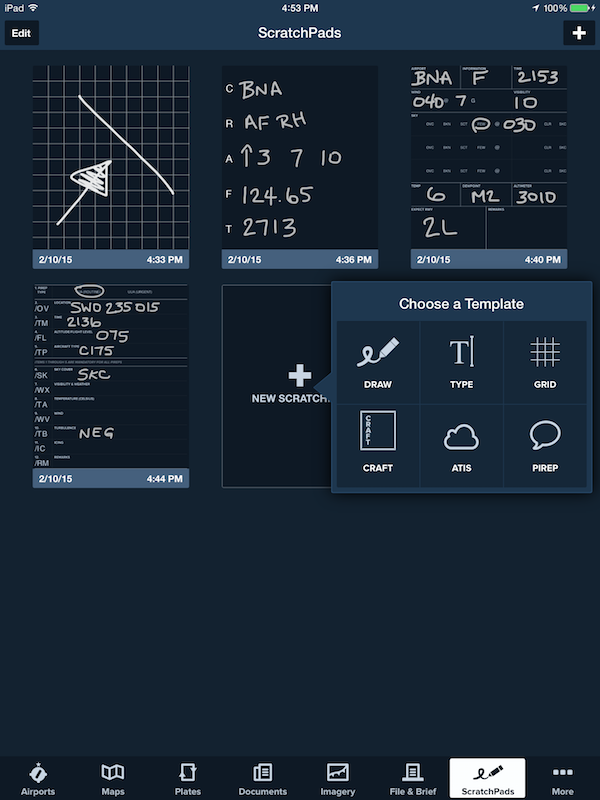 ScratchPads is available on the iPad to ForeFlight Mobile Basic and Pro subscribers. 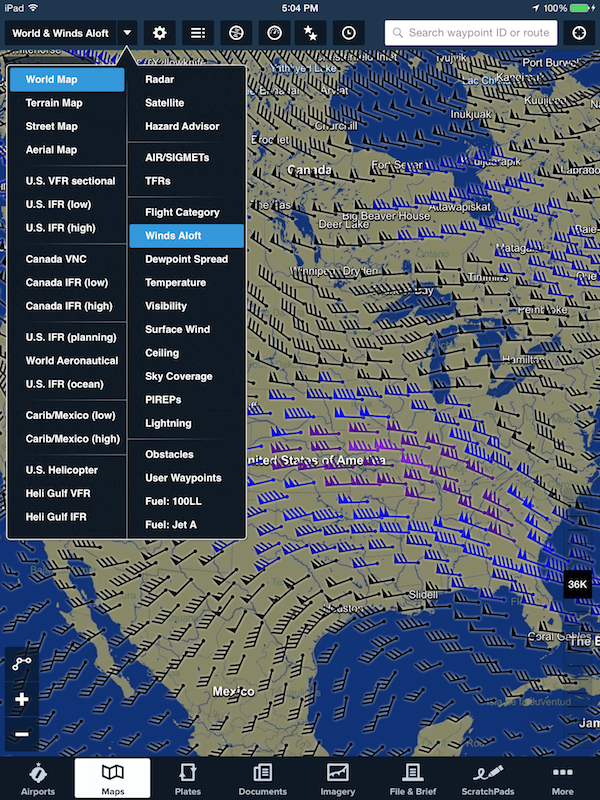 A global graphical Winds Aloft forecast is now available as a weather overlay option in the Maps view. The new Winds Aloft layer is available to all ForeFlight Mobile subscribers. 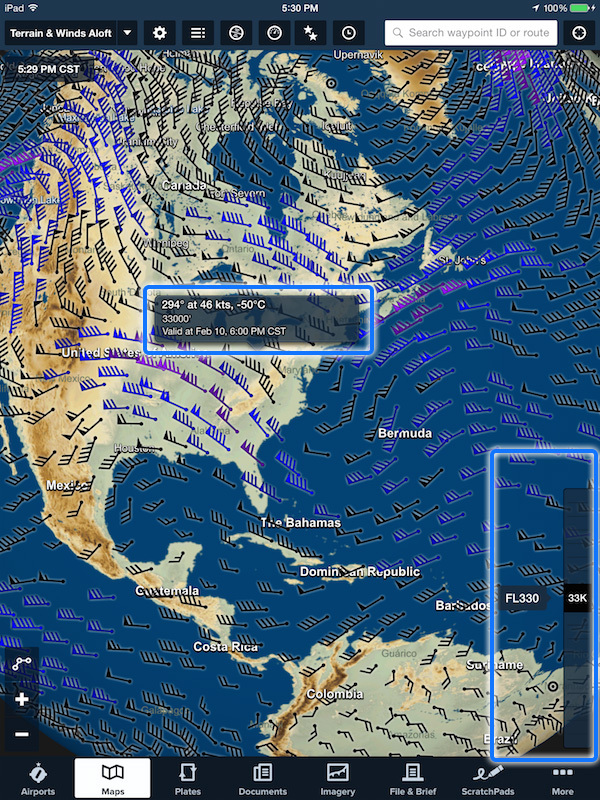 Global graphical Winds Aloft map layer is available in the map selector dropdown menu. Winds Aloft marker color scale. Use the slider on the lower right of the screen to select the desired altitude or flight level. Tap on a marker to view forecast details: wind speed and direction, altitude, temperature, and the winds aloft report time stamp. Use the slider on the lower right to change the altitude. Tap on a wind marker for details. 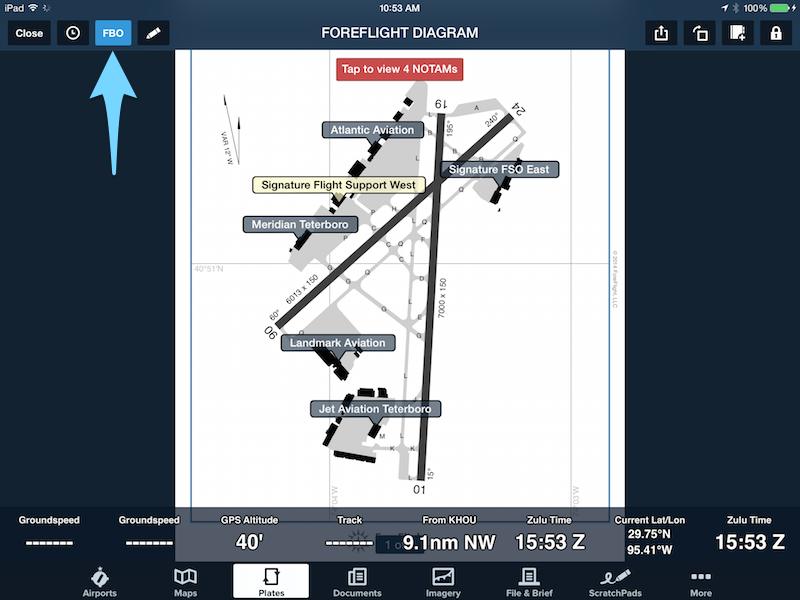 ForeFlight Mobile version 6.7 is a free download for subscribers via the Apple Store.